The Prospects for Cooperation between Russia’s Siberian and Far Eastern Regions with China in View of the Vladivostok APEC Summit. The United States, which holds the APEC presidency in 2011, is preparing to host the APEC summit in Honolulu this autumn where it will unveil ambitious and almost revolutionary proposals aimed at advancing the real integration of the Asia-Pacific region. These include proposals on a free-trade zone within APEC, reducing customs and tariff barriers, etc. If the plan is successful, it will turn APEC from a club of presidents into a genuine integration group that will make a bid for world economic leadership. After the Americans, the APEC presidency in 2012 will be passed to Russia, which will host the next APEC summit in Vladivostok on Russky Island. The challenge that faces us involves building infrastructure for the summit on the island (“out of the 19th century and straight into the 21st century”) and coming up with a package of comprehensive proposals on the further development of APEC. That would pose a serious challenge against the backdrop of the game-changing ideas of the American presidency. The reason for this is that our involvement in the economic integration of the region has been minimal so far. The Far East is still largely perceived as a military outpost, while frequent pledges to develop it economically have failed to produce the desired results. This is confirmed by the results of the latest census which produced stark evidence of the continuing outflow of residents from the area in spite of all the rhetoric about the “windfall profits” of the 2000s. In order to be prepared to host the 2012 APEC summit we have to offer a program that would lead to a qualitative leap in our openness and the integration of the Russian Far East and Siberia in international economic relations. That is impossible without intensification and a logistical breakthrough in the relations between the border areas of Russia and China. That is why an imperative of future relations between Russia and China is a new openness to investments into the Russian regions of Siberia, the Trans-Baikal area and the Far East. The aim is to create capital-intensive high-added value production in Siberia and the Far East and attract foreign investments into the production of Russian goods. That is a fairly new approach and its implementation may cause some concern based on historical stereotypes. For Russia the main fear stems from the psychological stereotype whereby “if we let the Chinese into Siberia we will lose it.” That fear may be challenged by statistics which prove that the apocalyptic forecasts of the 1990s regarding “the yellow threat” have not come true and that the Chinese presence in Siberia, the Trans-Baikal area and the Far East is stable and is not out of line with the permissible migration balance (it is certainly better than the migration balance in Moscow). Secondly, there is already evidence that Chinese investments have had a positive impact in Russia (mainly along the Chita-Blagoveshchensk-Khabarovsk line) where the Chinese are contributing to the development of our production infrastructure and to raising the living standards of our citizens. On the other hand, the main benefit of that project for Russia is also obvious: the accelerated industrial and infrastructure (hence, social) development of Siberia driven by foreign investment. Another plus for Russia stems from the notion that it is a lesser evil, and that if Russia does not open up Siberia and the Far East to investments (and thus maintain an active position within APEC) very soon the issue will be solved without us and Russian Siberia will be a prize for whoever wins the American-Chinese stand-off. The answer to the problem may be the promotion of the concept of “co-development” of the border regions of Russia and China. The Chinese regions located close to Russia (Heilongjiang, Inner Mongolia, Jilin and to some extent Liaoning in the north-east and the Altai area of Xinjiang in the north-west) have interests in developing cooperation with Russia that often do not coincide with those of the central authorities in Beijing. During the course of foreign economic conferences the economic managers of China’s border areas have often criticized Beijing, demanding greater autonomy for the border regions in their economic relations with Russia and permission to allow Russian investments in China. Besides, a crucial internal problem for China’s north-eastern regions is the existence of old industries (giant factories built under Mao Zedong) which are operating at a loss, are inefficient and require huge investments to be retrofitted and reoriented to other markets. The presence of the obsolete industries aggravates social problems in north-eastern China, which often prompts local people to migrate to Beijing and Shanghai inside China and to Russia. All this leads to widening gaps in the development of various Chinese regions, marginalizing the north-east while the priority is given to the development of China’s “seafront showcase” in the east (around Shanghai) and south (Guangzhou and Hong Kong). In this context, many representatives of China’s north-eastern provinces push for the need to coordinate the economic policies of the border regions of Russia and China and indeed their co-development. The Chinese regions raise this topic at the annual meetings of the Russian-Chinese intergovernmental border cooperation commission. The idea, though, has until recently found little support among the central authorities in Beijing or Moscow (in Beijing because it is reluctant to grant independence to the regions and to allow Russian investments into China; in this country, due to the above-mentioned fears of Chinese penetration of Siberia). And yet this approach could boost the development of the Russian regions in Siberia and the Far East in the new APEC environment. Above all, it would shift the debate on the regional aspect of Russian-Chinese interaction from the level of mutual fears to that of daily economic interaction, with the discussion and formation of mutually beneficial investment projects. A milestone political decision aimed at overcoming these problems was made in 2009 when Russian and Chinese leaders adopted a joint program of cooperation between the regions of the Russian Far East and Eastern Siberia and the north-east of China. The challenge now is to implement the program. So, Russia could recommend developing an official plan for the co-development of border territories (a kind of “co-development five-year plan”). The regions must take part in the development of the plan, which is in fact more important for the Chinese regions (in terms of opening them up and distancing them from the centre) than for Russian regions. Obviously, the first “co-development five-year plan” will be modest and will involve stand-alone projects. The development of the transport infrastructure is particularly important (especially in the context of APEC). Two ideas that have been shelved need to be “unfrozen.” The first is building a highway between Russian Altai and the Chinese city of Altai in northern Xinjiang, from the Chuysk highway across the Republic of Altai and the 50-kilometre western stretch of the Russian-Chinese border wedged between Kazakhstan and Mongolia, which currently has no transportation routes whatsoever. There was no need for it in Soviet times when Soviet-Chinese trade bound to and from Western Siberia and Central Russia passed through eastern Kazakhstan and the Druzhba station on the Kazakh-Xinjiang border. After the collapse of the USSR, Russia lost a direct transport link with western China. At the beginning of the 2000s the Altai administration under Governor Alexander Surikov lobbied the idea of a direct highway, an idea that had the support of the Xinjiang regional government. At the same time one could observe how Gazprom’s interest in building a western gas pipeline from Russia to China through this 50-kilometre section of the border waxed and waned. It looks as if the talks on this section of the pipeline are close to moving on to a practical stage. Building the gas pipeline and highway across Altai will contribute to the region’s development. Moreover, a direct road from Xinjiang to Western Siberia would greatly intensify contacts with China for Central Russian regions (which makes little economic sense today because of the huge transport costs involved in moving goods across the Far East and the whole of the Trans-Siberian Railway). Another project that has been on the back burner is the construction of a bridge across the Amur River to link Blagoveshchensk and the Chinese city of Heihe across the river. The bridge would facilitate economic ties between the Amur Region and Heilongjiang Province (currently linked by ferry during the summer) and would help to revive the economy of the most remote and depressed part of the Trans-Siberian line between Chita and Blagoveshchensk. However, that project was kept on the shelf for political reasons (mainly on the Russian side). In terms of political accords, the adoption of the aforementioned joint progam has changed the situation. It lists the Blagoveshchensk bridge as an agreed project. The program also includes the common view that it is viable to build two more bridges across the Amur, a railway bridge in the Jewish Autonomous Area leading to Birobidzhan and a motor bridge to Khabarovsk via the border islands, some of which were handed over to China in the process of border delimitation. If these three bridges are built they will bring the discussions of integrating our Far East into the economic links of APEC to a practical level. That would have a dramatic effect on the region’s economy and could ensure a more rapid development for the region in the future. As for institutionalizing co-development, there are already early positive signs on the western section of the border where, because of the sparsely populated northern Xinjiang Province, there is no demographic imbalance between Russia and China, like in the Far East, and fears of the “yellow threat” are much less prevalent. In the early 2000s, at the initiative of Altai Governor Surikov, a macro-region of cross-border cooperation called the Great Altai was created bringing together the Russian Altai Territory and the Republic of Altai, the Chinese Xinjiang and the adjacent areas of Kazakhstan and Mongolia. That cross-border region, modeled on the European Union’s “euro-regions” (specifically the Alps-Adria mountainous region), has the support of the Russian Foreign Ministry and is making good headway, mainly through interaction between the legislative assemblies of these regions and in the cultural and environmental spheres. In implementing co-development, that experience could be applied in the regions on the eastern section of the border where day-to-day interaction is much more intensive. 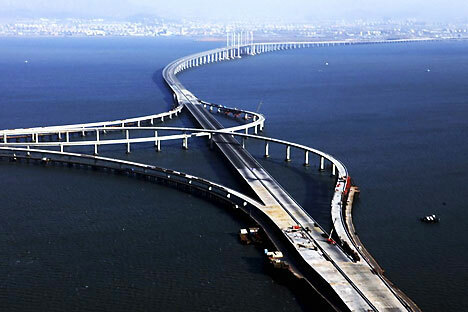 Thus, if one were to translate the main conclusion into the idiom of Chinese wall newspapers, the slogan would be “three bridges and one road.” It would include the Russian Far East and Siberia in APEC’s ambitious integration projects and indeed make Russia a natural (or “multilane”) bridge between the Asia-Pacific region and Europe. If that happens, the Vladivostok summit will be remembered not only for the impressive construction projects on Russky Island, but for major economic decisions that would mark a significant step in increasing Russia’s global competitiveness.